This afternoon, I was listening to one of my favorite all-time albums, A Gift From A Flower To A Garden (For The Little Ones). It has a definite renaissance-y feel, and whenever I put it on, I swear my blood pressure goes down. It always reminds me of being in college, when my friend Amanda and I would get up at the crack of dawn to go out and sit at the lake and freeze with our watercolors and cranberry-walnut muffins, being painterly. So this evening I took a break from working and dug out my box portfolio from back in the day, when I had done a calendar based on the songs of this album. This piece is (gulp!) 13 years old, and what amazes me is that I could slide this right into my portfolio today. Apparently I had a definite style even then. The song this illustrates is called "Epistle to Derroll". It's a Carroll-esque song about a man who is searching for his friend, a banjo-player with a tattoo on his hand. 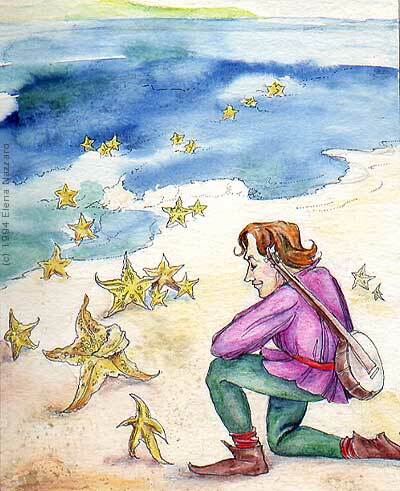 He calls all the starfish out of the sea to ask them if they've seen him anywhere. My favorite line says, "Come ye starry starfish/ I know your ways are caped/ Maybe it's because you're/ astrologically shaped." If you'll believe in me, I'll believe in you.